A senator's soul arrived in heaven and was met by St. Peter at the entrance. "Welcome to heaven," said St. Peter. "Before you settle in, it seems there is a problem. We seldom see a high official around these parts, you see, so we're not sure what to do with you." "No problem, just let me in," said the senator. "We'll I'd like to, but I have orders from higher up. What we'll do is have you spend one day in hell and one day in heaven. Then you can choose where to spend eternity," said St. Peter. "Really, I've already made up my mind. I want to be in heaven," said the senator. "I'm sorry, but we have our rules," St. Peter insisted. And with that, St. Peter escorted him to the elevator and he went down, down, down, down to hell. When the doors to the elevator opened, however, the senator found himself in the middle of a beautiful green golf course. In the distance was a clubhouse and standing in front of it were all his friends and politicians who had worked with him. Everyone was very happy and in formal attire. They all rushed to greet him, shook his hand, and reminisced about the good ol'days they had shared together, often at the expense of the people they were supposed to serve. They played a friendly game of golf and then dined on lobster, caviar, and champagne. Also present was Lucifer, the devil himself, who really was an incredibly likeable fellow that was the life of the party. Everyone was having such a good time that before the senator realized it; the moment had come for him to leave. Everyone gave him a hearty farewell and waved while the elevator rose. It went up, up, up, and the door reopened in heaven where St. Peter was found waiting. "Now it's time to visit heaven," said St. Peter. So, twenty-four hours passed with the senator joining a group of contented souls, praising God, singing hymns, with fellowship of the deepest and purest kind. The experience was truly meaningful and, before he realized it, the twenty-four hours had gone by and St. Peter returned. "Well, now, you've spent a day in hell and another in heaven. Now choose your eternity," instructed St. Peter. The senator reflected for a moment, then answered, "You know, I would have never believed that I would have said this before, heaven has been nice, but I think I would really be better off in hell." 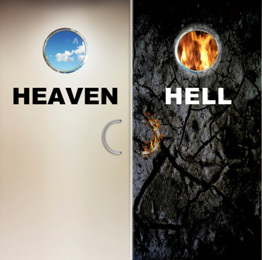 So, St. Peter escorted him to the elevator and he went down, down, down to hell. The doors of the elevator opened and he found himself in the middle of a barren land with a dark, ominous and foreboding sky. The heat was exceedingly oppressive. He saw all his friends dressed in rags, some naked and unclean, many pulling around the chains of their former vices in life. The devil came over to the man and put his arm around his shoulder. "I don't...I don't...I don't understand," stammered the senator. "Only yesterday I was here and there was a golf course and a clubhouse, and we ate lobster caviar, and drank champagne. It was tremendous. We were living the high life. Now there's just this wasteland, wasted lives, and miserable associations. What happened!?" The devil looked at him, smiled, and said, "Yesterday we were campaigning. Today you voted." The irony of hell is that it is the culmination of everything we ever really wanted and the just deserts of our actions. It is the harvest we sowed on earth. The message of judgment is that in the end, none of us ever gets away with anything. No one, however, has to go to hell. Christ died to redeem us from the threat of eternal punishment. He suffered hell for us on the cross – taking our punishment on Himself. But we have to make a choice. We have to vote. We have to choose between Him and our sin. We can trust Him and be changed and given a new heart for what God wants for us, or we can reject Christ and go on in our own way. Every person faces this choice in their lifetime. This decision determines where we ultimately spend eternity. How will you choose? Vote Christ! Decide for Him! 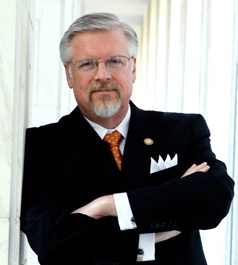 The editorial above is a revised version of an article written by Dr. Mark Creech. The parable was adapted from a collection of humor from "The Greatest Joke Book Ever" by Mel Greene.